Our plans for this outing were as changeable as the weather. We had originally planned this outing on the new trail from Plainfield as a ski. Eight days earlier, on a scouting trip, we found excellent snow. In the meantime climate change and record warm temperatures foiled our plans and we cancelled the ski. Then we decided to do it as a snowshoe. 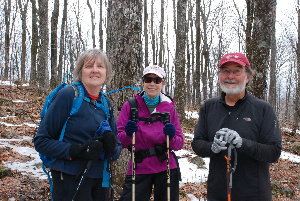 Four of us explored this new trail, not yet officially open, which connects the existing Spruce Mountain Trail in Plainfield with Seyon Ranch and Noyes Pond in Groton. Surprisingly, we found less snow higher up, with some southwest facing slopes at 2, 000 feet devoid of snow. Despite the strange conditions, we enjoyed the mild weather and had a picnic in the sun without gloves. 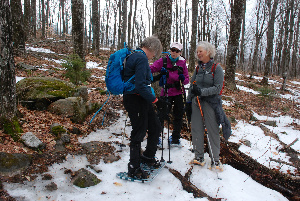 It was a chance to explore a new trail, which Vermont Forests and Parks has wanted to complete for many years.